It is the heart of downtown Naha. 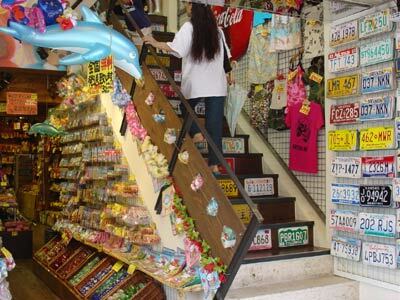 Since the postwar years, Kokusaidori has been the hub of Okinawa’s shopping district. 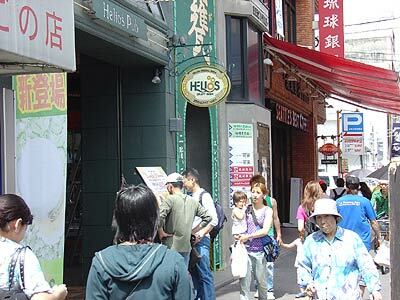 Named after the Kokusai Theater, now long only a memory, the street is home to department stores, shopping outlets, eateries and popular coffee shops. Kokusai street reflects the cosmopolitan nature of Okinawa, attuned to the world yet laid back and filled with everyday people. Since it’s construction in 1953, when it was dubbed “the miracle mile” for its fresh look, Kokusai has been the setting for literally thousands of public events and festivals staged for millions of visitors. The heart of it all, though, is shopping. It is a treasure trove for even the most inveterate shopper. It’s all available on Kokusai, or within its meandering market stalls at Heiwadori [we will explore this cultural icon next week]. Kokusai has clothing, shoes, alcohol, traditional Okinawa glass and pottery, and souvenirs of every type. For the more traditional shopper, Kokusai is home to three major department stores. Ryubo is a nine-story shopping extravaganza, with a supermarket in the basement and five floors of men’s and women’s designer clothes and accessories. Three floors are filled with books, housewares and gift items. Atop it all, a nine floor featuring a variety of restaurants to relax after intense shopping. Mitsukoshi Department Store is in the midst of the 1.6 kilometer strip. Traditional styles from Coach, Tiffany and Guchi headline the shelves, while upper floors offer brand name clothes and accessories for the entire family. European gifts and housewares are also available. Of course, Mitsukoshi also has a bevy of restaurants on the top floor to provide the all-important shopping break. OPA is nominally a department store, although its 50 stores are independent merchants working together to give you plenty of opportunities to find exactly what you’re looking for. OPA also has a records and CD’s store, and a pair of discos pulsating with the latest sounds. A stroll up or down the length of Kokusai is always a pleasant experience. It is not, however, a place for quick shopping. There is simply too much to see and do. Hundreds of shops display their wares for you. Leather? 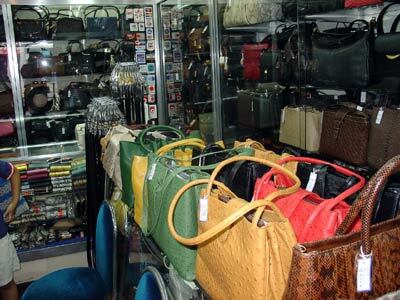 Try RFI about a third of the way down, where you can find belts, shoes, handbags, wallets and more made from dozens of exotic skins including snake, elephant, zebra, horse, ostrich and antelope. Homesick for home? Try the USA shop on the lower [Ryubo] side of the strip. Here you’ve got everything from U.S. license plates to the original Big Boy drive in chubby fella. Traditional Okinawa wares are everywhere. Clothing, shi shi, awamori, …you will find a shopping selling one or more of these every 50 meters. And those American names for coffee have found their way to Okinawa as well. Starbucks and Seattle’s Best Coffee are located midway down Kokusai. If you don’t find what you’re looking for, consider one of two things: It is in Heiwadori, and we’ll venture there next week, or … you need to refine and define your tastes. Good shopping. Kokusaidori, the street, is a public thoroughfare. There are no costs to drive or walk the street. Shopping and dining are whatever costs you elect to incur. By taxi or car, drive south on Highway 58 from the military bases. As you enter downtown Naha, you have several options. Your first option is to turn left at Maejima, just south of Tomari [Tomarine Hotel on your right], at the intersection of the Roynet Hotel. This brings you to the north end of Kokusai street. The second choice is to go to Kumoji intersection, about one-half kilometer further into Naha. The intersection has a Hot Spar convenience store on the left corner. Turn left and travel two blocks, under the monorail line. Ryubo Department Store is on your right. Again turn left and you are on Kokusaidori.